There are few weather conditions that can turn a run miserable in a matter of miles, cold rain is tops on that list and that’s what the MRC Sunday Long Runners got handed today. With temps hovering around 40 and drizzle falling a group of 17 runners, 5 drivers, and 2 water stop assistants hit the highway for Hopkinton, pulling onto Marathon Way just after 8AM to start a momentous long run. Three runners met us there for a total of 20, plus another member of the support crew. A picture in front of the Dough Boy statue (check us out) and a bit of traffic stopping lining up along the starting line and they were off! 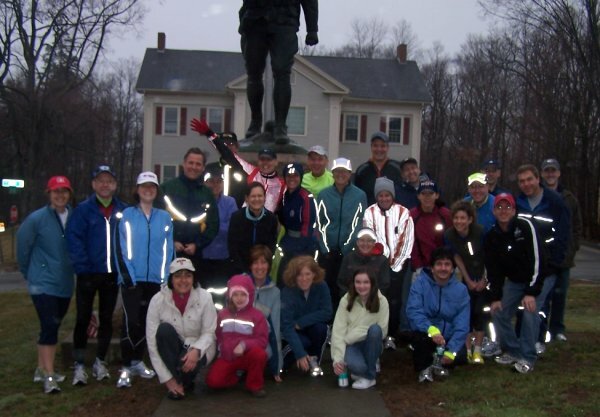 The first leg of the run stretched out along the country roads of Hopkinton and Ashland. Joe, Judi, Katie, and ErinW took the lead and were the first to be waved into the water stop by LizzieC. BarryC and ErinL quickly jotted down names on plastic cups and ensured each runner was fed and hydrated before sending them back out onto the road. As this group hit the road again the next wave came in, BrianG, Ed, and Carol surged in with Walt and Demi right behind. Then another wave of Ginny, Christina, DaveH, Lauren, Lois, Jose and his friend, Peter, Suzanne, Nancy and Matt. 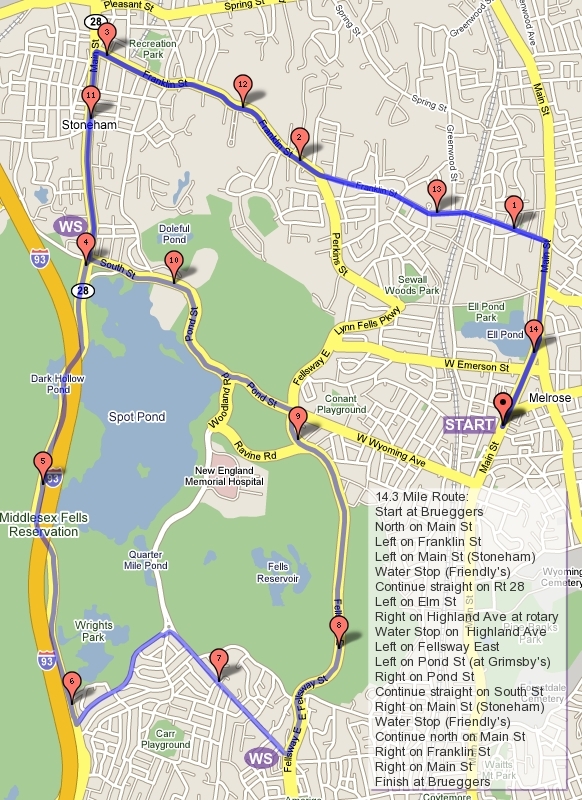 Nick Lamberti drove along the route ensuring there was no runner left behind. During the second leg a hard, steady, cold rain soaked the runners. The rain was so drenching that the laundry detergent that didn’t fully rinse off runner’s pants began frothing on their knees. First it started on Lois’ bubbly knees, then later in the run on Ginny’s. By the end of the run there were several sudsy kneed runners along the course. Just before the second water stop there was a unique Sunday Long Run photo op. It’s well documented here that Snickers are the official snack of Sunday Long run, and this week there was a discussion about the math involved in planning out the candy needed for 6 water stops along 22 miles for 20+ runners. 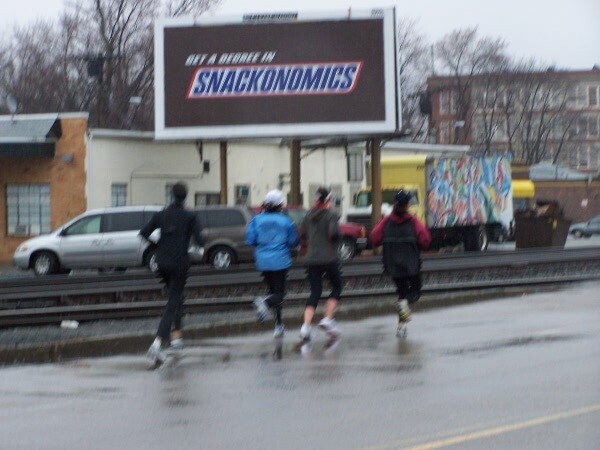 Hovering over Framingham was a Snickers billboard stating “Get a Degree in Snackonomics”… who knew?! The second water stop were manned by snackonomists SueC, her daughter Danielle, and Liz, each handing out Gu and Gatorade as quick as possible to minimize the runners idle time. The next stretch began a plague that would hit every runner along the route today: frozen Fingers. While BarryC and ErinL utilized the famous alphabeticÂ papercup clothesline approach instituted by Rick weeks prior, we processed runners water stops extremely efficiently at the Natick Center stop. Runners took the time to search for methods to warm their hands though. ErinW borrowed a pair of mittens to help her through the damp cold air. Behind her Joe borrowed gloves to cover his frozen fingers. Later Demi would ask for assistance putting on a tight pair of gloves that just didn’t seem to fit in a scene that resembled the OJ Simpson trial… f the glove don’t fit, you must acquit. Borrowing a pair of Tall Dave’s gloves allowed her to carry on out of Natick back into the cold harsh headwind. The day was not done with Demi there though. Now that her hands were covered her feet fell victim to an assault. Somewhere along the way she picked up a nail in her shoe. At the next water stop she showed the bottom of her shoe with a head of a nail poking out of it. This was obviously not her day, which became more evident as the cold wet wind and pelting rain wore her down and 16 miles into the run she made the smart decision (with some convincing from the water stop crew) to wrap her self in a blanket and sip on some Starbucks coffee and fill her body with warmth that was robbed of her throughout the run. Wise choice Demi, you live to run another day! As Demi warmed up, Erin and Barry opened gu, unwrapped Snickers, and poured Gatorade for the runners while Suzanne’s husband and five kids (all of whom seemed to be about 4 years old) served up drinks and orange slices, feeding our runners well before sending them on their way across Hells Alley, the stretch of cement that crosses over route 128 and into Newton. If all that wasn’t enough, Jose broke into his bag of rice, and a somewhat unorthodox move he tested the effect of a bowl of rice midway through a marathon… I would have never thought of that. The final water stop was located right after the Johnny Kelley statue. With the silhoute of two runners holding hands raised stood behind our fearless friends, they strode up the middle of the Newton Hills, some smiling, some grimacing, some ordering alcoholic drinks at the water stop… each gearing up for one last test of will. 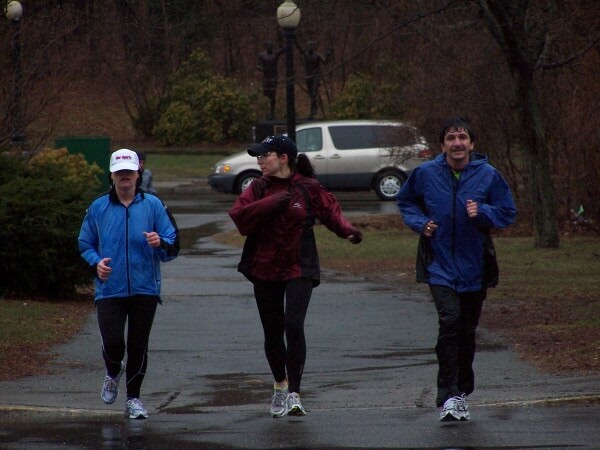 The downpours subsided and the drizzle that had started our day returned to usher our runners up Heartbreak Hill. The finish of the run was much different than last year. Where we stood in sunshine lounging on the grass at St Ignacius Church on the campus of Boston College in 2008, runners wandered around looking for dry clothes and warm blankets, teeth chattering, bodies shivering, hands clenching hot Dunkin Donuts coffees. With a major test of fortitude behind them they piled into the first warm car they could find and headed straight home to Melrose, to warm baths to sooth their frozen bones and cold beers to celebrate surviving a brutal test. The worst is behind you, the best is coming soon! All these cars are automatic (right?) so anyone can drive them. So the only issue is there’s 5 drivers but two of us want to run half the course, which means we need 1 more full time driver or 2 more half route runners. If we don’t get that we’ll either drop one of the cars and have to squish in a little tighter… or Sue and I will run tomorrow and drive on Sunday. Any comments or suggestions on that plan, let me hear them. On order to plan the cars for this weekend’s long 22 mile run, I need to know who is running what. Please respond to this post with a note about what you want to run, if you want to help with water stops and if you have a car to use to transport runners and for water stops. Also let me know if you’ll be bringing anyone else. The hope is that the number of seats, the number of runners, and the number of drivers all add up… which oddly enough it has worked out the past few years. Our first Spring run has come and gone and 24 of us enjoyed all or part of it. The run started late as my ailing car decided to stop for a break along the grueling 1/4 mile ride to Brueggers. Much like a struggling runner is revived and renewed with a quick drink and a Snickers, this little stall has reinvigorated my limping car, which is a good thing since it was signed up to contribute 3 of the 5 water stops this morning, each stop serving as an opportunity for me to toss out automotive questions to our local mechanic-like experts. The start of the run followed East Foster St up towards Melrose Common where the route took a right turn to Swains Pond. It’s been reported that the roadkill of the year was spotted there, something you would never guess you would see… somewhere near Swains Pond a dead fish was in the road. I didn’t see it since I was rushing along Main St to water stop 1 at the Citizen’s Bank in Malden. Teresa joined me there and we waited in the windy frigid air for the runners to come. One by one they strided in, Judi and Joe comfortable but quick lead the pack, Brian, Ed, and Audie right behind them. Carol and Mary followed, then Tall Dave, Christina, Ginny, Jose, Lauren, Catherine, Evan, Sue, Joanne, Suzanne, Lois, Pam, Peter, and Matt (I think that’s everyone). Teresa joined them for this leg, out past Oak Grove, along Greenwood to the Fellsway East. Working the hills they went, riding the roller coaster to the next water stop at the knoll by Melrose Middle School. I moved my car, fingers crossed that I would make it, stopping once to grab a hat and gloves from home on my way by. The order of the pack stayed consistent as runners came in, took their cups off the clothesline inside my trunk, downed some Gatorade, clipped their cup back up and raced off towards Saugus. I joined in here and mixed into the pack chugging down the LynnFells. At Main St in Saugus many of the runners hooked back along Howard to trace the 11 mile “short” route. As spring approaches even the short routes are getting long. I went with the long route runners to Breakheart where, as we approached Judi and Joe came storming out… three miles ahead of us and smiling and high fiving like they weren’t even trying. Liz met up with here, starting her run at mile 10. At Breakheart a sure sign of Spring was evident, park rangers were busily demonstrating the process of maple sugaring, but a few steps in showed we’re still not completely clear of winter where snow and ice still lined the trail on the flat side of the reservation. Our loop around would begin and end with a water stop at Peter’s car, a pleasant bookend to what always proves to be the toughest section of the run… although some have been quoted as noticing that Breakheart isn’t as tough as it was weeks ago. Leaving Breakheart, we retraced our steps along the LynnFells, back to my car at the knoll where my run would end for the day. I finished this stretch with Suzanne who had a solid, strong run today. One quick drink and she was off without hesitation to tackle the last hill of the day on the LynnFells towards Grimsby’s where the route turned down West Wyoming and back to Main to finish up just short of 18 miles. Peter followed, Matt cut the run slightly short, and Liz, Lois and I piled into my sick little car and drove back to Brueggers without incident. At Brueggers were smiling faces, the 20 mile run two weeks ago having made 17.8 today a walk in the park. It is amazing to watch, season to season, how that first 18 mile run seems so difficult and the second one seems so much easier… in fact so much so that Brian wasn’t the only one that tacked on a little extra today, a few put in the extra 1/4 mile so they could say they ran 18. Great job everyone. For those that are wondering, I drove my car for a half hour this afternoon with no oil light, no hesitations. Remember along your marathon journey that sometimes when your internal oil light comes on that sometimes pulling over and regrouping for a second can do wonders… although I suggest keeping your fingers crossed the rest of the run. Today Spring officially sprung, chronologically more so than meteorological. This Sunday we’ll take our first Spring long run and we’ll mark it with a different start to the run. Instead of heading North or South on Main St as we have all winter long, we’re going to head up to Melrose Common, swing around Swains Pond, wander over to the Fellsway East, continue down the Lynn Fells Pkwy back to Breakheart for a few late hills in the run, then head all the way back the way you came until you hit W Wyoming Ave where you turn home to Brueggers. Almost 18 miles for those running long while those running short can cut back several different ways to tailor their runs to be 4.5, 7, 8, or 11 miles. My car is acting up again (oil light is coming on)Â so I’ll need some extra help for the water stops. Take a look at the map and let me know if you think you can help. Thanks! It’s time again for the ROLL CALL! Who’s in?